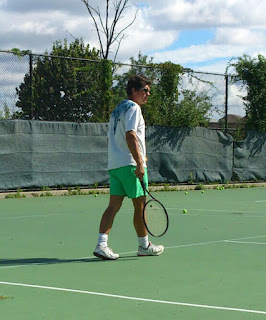 For a tennis junkie like Yuri Krainov, summer is the most wonderful time of year. The sun is shining, people are available to play and paying for court time isn’t necessary. Yuri, 53, joined Tennis League Network three years ago and has found his niche on the court. He recently played his 200th match with the site, putting him in an exclusive club alongside several other devotees. In the summer, the Brooklyn, NY, resident Krainov plays tennis nearly every day. Sometimes he needs a break. He’s only human. But he’s generally out there at least five times a week, oftentimes making his opponent’s life miserable. Krainov is a dentist, so tennis serves as the perfect escape after a long day at the office or a thought cleanser on the weekend after a busy week. Many of his opponents would agree that playing him is like pulling teeth. He’s the kind of player who gets everything back. You can beat him, but you’re going to have to work hard to do it. “A lot of players tell me that I play a defensive style,” Krainov said. Defensive tennis is a mixed bag, because sometimes it works and sometimes it doesn’t – depending on the day and the opponent. Against one particular foe, Alex Twersky, that strategy is effective about half the time. Yuri and Alex have played dozens of matches. They’re often grueling, but they’re always fun, according to Krainov – who has a 3.5 rating. There’s also his archrival (OK, maybe not quite, but they don’t hold back on the court), David Romero, who he once battled in a 10-game pro set for two hours in the 90-degree heat. Krainov, who was born in Russia and moved to the United States almost 25 years ago, played minimally in Russia. He was always interested in the sport, but he had trouble finding partners or ample time. When he moved here, he played more regularly for a few years but stopped for a few years after that. He dabbled a little more, then he took an extended break for close to a decade as his professional career took off. About three years ago, he decided to pick up the sport again but he wasn’t sure who he would play with. He found TennisNewYork.com part of the the Tennis League Network online, and the rest is history. Now he has the bug, and he’s showing no signs of slowing down. This is his time of year, so if you mosey down to the courts in South Brooklyn there’s a good chance you’ll see him swinging away and getting ball after ball back. Bimal Patel plays in the San Jose Tennis League. He is passionate about tennis and plays as often as he can. He follows the professional tennis and tries to attend tournaments whenever he finds an opportunity. He has been to the US Open, Indian Wells Masters 1000, and the Aptos (California) Challenger Tennis tournaments. During a recent trip to London, I was lucky to find some time to visit Wimbledon. Wimbledon offers a fascinating access to the Lawn Tennis Museum and a guided behind-the-scenes tour which should be every Tennis lover's delight! Tour takes around 1.5-2 hours and should interest even the non-tennis fans. It is not exactly cheap (25 pounds ~ approx US$ 31.5), but is well worth the price. Guided tour takes you around the grounds, players lounge, BBC broadcast booth and visit to the famed Centre Court. There is also a visit to their underground IBM center which provides the digital support for live matches broadcast across the world on TV, Radio and Wimbledon.org website. Our group included visitors from Argentina (Del Potro fans, of course ! ), Czech Republic, India, the US and local British visitors. As our guide explained, Championships are held during 2 weeks in June-July and the remaining 50 weeks are spent preparing fo the next Championship. Once the championships are over, all the grass courts are dug up and completely redone with fresh new grass ... no sod is used! All the courts are surrounded by electrified fence (to keep the foxes out) as they let new grass to grow (see picture). Outer courts are surprisingly close to each other (see picture). Center court is not as big as it seems on TV, it is quite cozy and has an intimate feel (unlike the Arthur Ashe Stadium at the US Open).